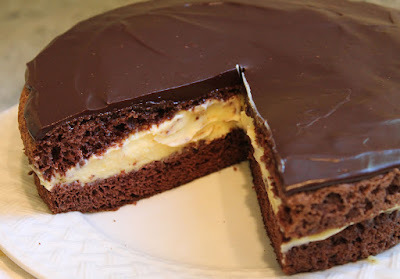 Boston cream pie is a favorite dessert in my family. If you were to ask Hubby, he'd say I don't make it nearly enough. 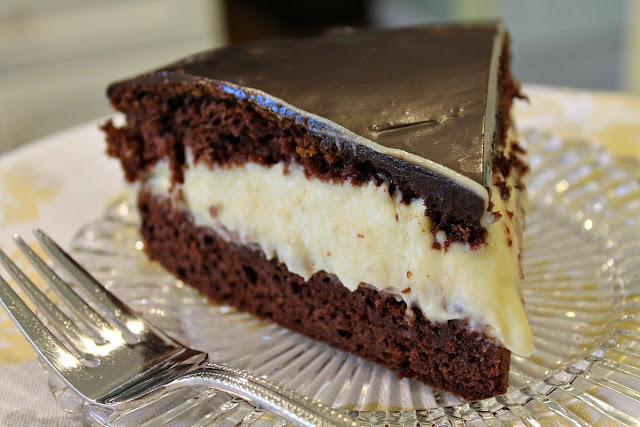 This chocolate Boston cream pie came about for that reason. The other day I noticed I still had a chocolate layer cake in my freezer from a chocolate mousse cake I had recently made. The texture of the chocolate cake from that recipe was one I thought would work well with the pastry cream of a Boston cream pie. I was right. 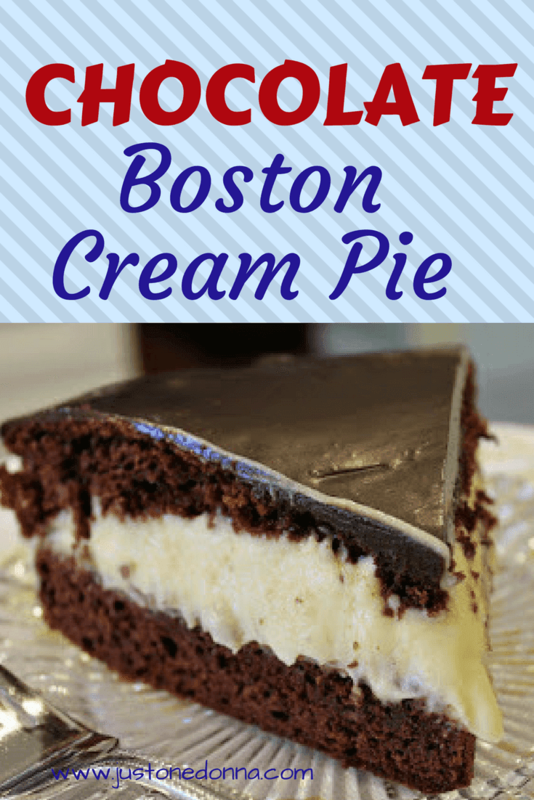 This chocolate Boston cream pie is made completely from scratch but don't let that scare you away. The only difference between this cake and a traditional Boston cream pie is the substitution of chocolate cake, drizzled with a vanilla syrup, in place of a yellow cake. There are three easy steps to this cake. Consider making the cake ahead of time. You can make the cake in advance and freeze it, like I did. The cake thaws quickly and you'll find it easier to cut the chilled cake in half before adding the pastry cream filling. I have to tell you that I love this cake. I also have to warn you that like me, you may end up eating more of it than you should. This chocolate Boston cream pie is an addictive cake. I think I may like this chocolate version better than the traditional Boston cream pie. I know, that's heresy, but this is one darn-delicious cake! Preheat your oven to 350°F. Grease a 9-inch round cake pan. Line the bottom of the pan with waxed paper and grease the paper. Sift the flour, cocoa, and baking soda into a small bowl. Using your electric mixer, beat the egg yolks and 1/2 cup sugar together in a medium bowl until very thick and light in color, about 3 minutes. Add the vanilla and Kahlua. Stir to combine. In a separate bowl, using clean beaters beat the egg whites, cream of tartar, and salt until soft peaks form. Gradually add the remaining 1/4 cup of sugar, beating until stiff. Fold 1/3 of the egg whites into the yolk mixture. Alternate folding in the flour and egg whites, ending with the egg whites. Spread the batter evenly in the cake pan. Bake the cake until puffed and tester inserted into the center comes out clean, about 18 minutes. Cool in the pan on a rack. Cut around the pan to loosen the cake. Turn the cake out onto your work surface. Remove the paper. Using a long, serrated knife, cut the cake in half, horizontally. Place half of the cake, cut side up, on your cake dish. Drizzle half of syrup (about 3 1/2 tablespoons) over each side of the cake. Bring the heavy cream to a simmer in a medium saucepan over medium heat. While the cream is heating, whisk the egg yolks, sugar and salt together in a medium bowl until combined. Whisk the cornstarch into the egg mixture until pale yellow and thick, about 30 seconds. Slowly whisk half of the hot cream into the egg mixture to temper, then return the mixture to the saucepan and cook over medium heat, whisking constantly, until thick and glossy, about 1 1/2 minutes. You'll want the mixture to come to a boil. Be sure the pastry cream is very thick before your take it off the heat. Off the heat, whisk in the butter and vanilla. Transfer the mixture to a small bowl, press plastic wrap directly on the surface, and refrigerate until chilled and set, about 2 hours. Spoon the pastry cream onto the bottom half of the cake. Spread evenly to the edges. Top with the other half of the cake. Pour the warm ganache over the top of the cake spreading to the edges and dripping down the sides, if desired. Chill cake until ready to serve. Get more yummy cake recipes from my Cakes Pinterest board. This looks so good. I just pinned it to make it this week!